Hammock Beach Resort in Palm Coast bills itself as Florida's premier oceanfront destination. This large resort has accommodations to meet the needs of almost any combination of guests. Guest rooms in the Main Tower, which feature a view of the Atlantic Ocean, offer the choice of one-, three- and four-bedroom suites with living and dining ares, fully equipped kitchens and a washer/dryer unit. Hammock Beach is well-suited for families. In addition to the beach, the resort is home to a 91,000 square-foot water pavilion with a water slide and lazy river. The resort has several restaurant options, ranging from fine dining to poolside casual. Hammock Beach advertises itself as one of the East Coast's "premier" locations for meetings, conference and events with more than 80,000 square feet of indoor and oceanfront function space. The par-72, 7,201-yard Ocean Course at Hammock Beach Resort is a Nicklaus signature design, featuring six holes that border the ocean -- the most of any golf course in Florida. The Conservatory course is a Watson signature design, rated as the longest and most difficult course in the Sunshine State, playing at more than 7,700 yards from the tips with a course rating of 78.4 and a slope of 155. The Omni Amelia Island Plantation Resort offers a Dye Hard Golf package for serious golfers looking to play round after round until the sun goes down. 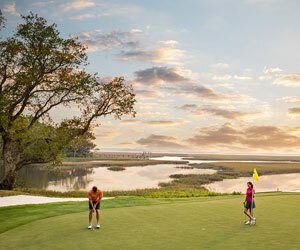 Package includes unlimited green fees, complimentary bag storage, range balls and cart use as you play as many holes as you can on our Pete Dye designed Oak Marsh, championship course that rolls through Amelia Island's natural beauty featuring tidal marshes and Spanish moss draped live oaks.